Explanation: Why is the Lobster Nebula forming some of the most massive stars known? No one is yet sure. Near the more obvious Cat's Paw nebula on the upper right, the Lobster Nebula, on the lower left and cataloged as NGC 6357, houses the open star cluster Pismis 24, home to these tremendously bright and blue stars. The overall red glow near the inner star forming region results from the emission of ionized hydrogen gas. The surrounding nebula, featured here, holds a complex tapestry of gas, dark dust, stars still forming, and newly born stars. The intricate patterns are caused by complex interactions between interstellar winds, radiation pressures, magnetic fields, and gravity. The full zoomable version of this image contains about two billion pixels, making it one of the largest space images ever released. NGC 6357 spans about 400 light years and lies about 8,000 light years away toward the constellation of the Scorpion. sea life parade . Tomorrow the Mermaid nebula ? Indeed, why has the Lobster Nebula formed such massive stars? To me, however, an even more interesting question is why star formation in the Milky Way appears to be shutting down. Our own galaxy is in an intermediate state between vigorously starforming spiral and elliptical galaxies and elliptical and lenticular ones that are "red and dead". 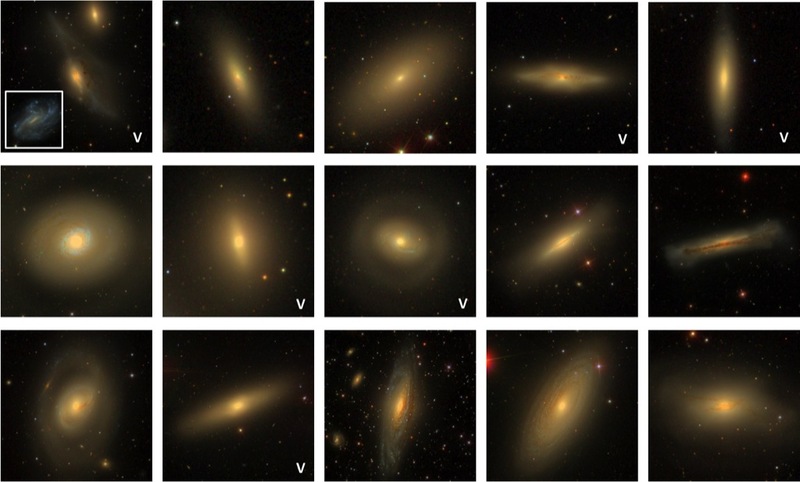 Green valley galaxies are relatively rare, and it is possible that such galaxies are about to transform into "passive", non-starforming galaxies in a cosmologically relatively short time. It could be that extremely massive stars like the ones found in Pismis 24 are not the "last starforming gasp" of the Milky Way, but maybe it is really at the tail end of the glory days of star formation of our galaxy. In a way, it is perhaps sunset in our galaxy - though not yet, it must be said, for a star like the Sun. I would have been good to precise that the round colored halos around all bright stars are not nebulas but reflections in the optics! They are very visible and I think that's confusing for most people. NASA mantra: "Follow the water." This image would be so much better north up! ta152h0 wrote: sea life parade . Tomorrow the Mermaid nebula ? Thierry Legault wrote: I would have been good to precise that the round colored halos around all bright stars are not nebulas but reflections in the optics! They are very visible and I think that's confusing for most people. If so, how come not every star has a halo??? Technically, they do, but you can't see the ones around the dimmer stars. And yeah, when I saw this image I was aghast that the filter ghosts were left in. They confuse a lot of people. The stars with the halos are a lot brighter than the other stars. This isn't apparent because the dynamic range has been so flattened in order for the wide intensity range to be represented on our very limited displays. If you look closely at the halos, however, you'll see that they all share a common structure in terms of how they show multiple images of the telescope aperture. They're certainly not nebulas or other physical structures. They're optical artifacts. geckzilla wrote: And yeah, when I saw this image I was aghast that the filter ghosts were left in. They confuse a lot of people. It does, however, provide a good representation of a scientific image, which would never have optical artifacts removed. There is, in fact, no way to remove these halos without compromising the scientific value of the image. Which part of my comment do you disagree with? Regarding the first: in a sense, scientific images may at times have their optical artifacts removed, although it would be more accurate to say that they are subjected to some kind of processing that allows the data they are obscuring to become more apparent. Regarding the second, I'd say that's perfectly factual. Any processing that removes the artifacts for visual purposes will certainly remove real data as well. A larger question is how much information should the editors repeat from the original image page linked from the description. Is it necessarily a judgment call, or are there specific guidelines? Didn't our cosmic exxplorers find a large blob of water floating around, the size of a galaxy ? ta152h0 wrote: Didn't our cosmic exxplorers find a large blob of water floating around, the size of a galaxy ? No, and the reason is that there is so much hydrogen and so comparatively little oxygen in the universe. The hydrogen content of the baryonic matter of the universe is about 74%. The oxygen content is about 1%. There would be no way you could concentrate so much oxygen in a single galaxy-sized gas cloud that you could turn that cloud into a blob of "water only" or "mostly water". There could, however, be a gas cloud somewhere that is unusually rich in water molecules, but that is not the same thing as a large blob of water. In regard to the halos, in the information brought up through the 'featured here' link it states "Note that the circular features in the image around bright stars are not real, they are due to reflections within the optics of the telescope and camera". I notice that many of them look spooky with 2 'eyes', with perhaps the best of them being the large blue halo (that beneath the Cats Paw) that is particularly spooky looking when the enlarged image is brought up when clicking on the APOD image. I see two small circles in all of the star bubbles, some more faint than others. Is this a natural phenomenon or is a function of the telescope? I see two small circles in all of the star bubbles, some more faint than others. Is this a natural phenomenon or is a function of the telescope? bakerc wrote: I see two small circles in all of the star bubbles, some more faint than others.